In the early days of the horror film, to keep the new craze going, producers were always on the lookout for suitable material, and the lurid ‘Penny Dreadful‘ serialised stories of London were an ideal source. 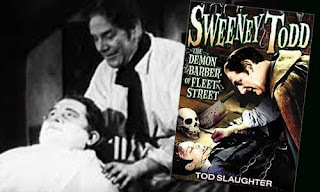 ‘Sweeney Todd, the Demon Barber of Fleet Street’ was an irresistible character - he cut the throats of his customers and then had them ‘fill in’ inside the meat pies made by his partner-in-crime Mrs Lovett for her pie shop. He first appeared in razor-sharp detail between 1846-47 in the story The String of Pearls: A Romance, credited to James Malcolm Rymer and Thomas Peckett Prest in The People's Periodical and Family Library. Sweeney went on to become a recurring figure in melodrama, expanding onto the big screen in various versions before achieving arguably his most famous incarnation courtesy of the brilliant Stephen Sondheim/Hugh Wheeler musical in 1979 based on Christopher Bond’s 1973 play. Sweeney Todd not only won Tony Awards but has been revived so often that this version of the story is the most embedded in our minds and leads many to believe mistakenly that he was a real person. In reality, the inspiration for Sweeney had long been a ghoulish urban myth recycled by the public and writers alike even before his personalised literary debut, Dickens had hinted in his own serialised novels at such unsavoury savouries in the Metropolis: streetwise servant Sam Weller in The Pickwick Papers warns of cat-meat pies passed off as beef-steak and Tom Pinch in Martin Chuzzlewit (1843-44) refers to “the dens of any of those preparers of cannibalic pastry”. 1928 saw the first film translation, with Todd played by Moore Marriott, best known for later playing old Harbottle in Will Hay’s popular movie comedies. Then in 1936 came the version we focus on here, directed by George King whose first feature Too Many Crooks in 1930 introduced Laurence Olivier to cinema audiences. Sweeney Todd: The Demon Barber of Fleet Street was the second lead movie role for the magnificently-named Tod Slaughter (the real surname of actor Norman Carter Slaughter). Newcastle-born Slaughter had begun his theatre career playing mainstream parts until he took ownership of South London’s Elephant and Castle theatre in 1924. There, his stage name was now matched in tone by a crowd-pleasing shift into Victorian Grand Guignol horror plays acted as high melodrama. By then, this late Victorian acting style revolutionised by Sir Henry Irving - thrillingly modern in its time - had become somewhat outdated and laughable, but by sheer force of passion on Slaughter’s company and technique revived the playing style to great popularity. In their excellent study London’s Grand Guignol, Richard J. Hand and Michael Wilson point out that melodramatic stage acting in the 1920s could still be a potent force “when used judiciously to express extreme emotions or passions, or to create moments of tension”. In the three years he ran the Elephant Repertory company, amongst a varied repertoire Slaughter presented productions such as Sweeney Todd and Maria Marten which built him a personal brand-name for vivid villainy. (This reputation would lead to his media nickname of ‘Mr Murder’ in 1931 when he doubled-up at the New Theatre as Treasure Island’s Long John Silver by day and infamous grave-robber William Burke by night in The Crimes Of Burke And Hare). Surviving live footage of the repertory company can be seen in the 1926 silent documentary London after Dark, possibly the only recorded example connecting classic theatre Grand Guignol tradition with the newly-emerging horror cinema. Tantalising clips show the cast of the military drama The Flag Lieutenant, with Slaughter glimpsed making slightly histrionic declamatory gestures. Although filming a stage performance isn’t a fair reflection unless tailored to the subtleties of the screen, we are shown the audience’s spellbound attention, an intertitle observing: “…with that sincere appreciation which is so rarely found in West End theatres”. Slaughter’s style may not have been suited to the stuffy high-brow element but in terms of the vital bums-on-seats it worked very well. 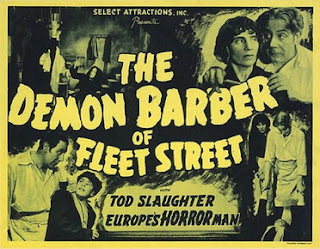 After a further 2,000 theatre performances as Sweeney Todd, his work would be preserved in King’s 1936 film distributed by the director’s own-named production company. 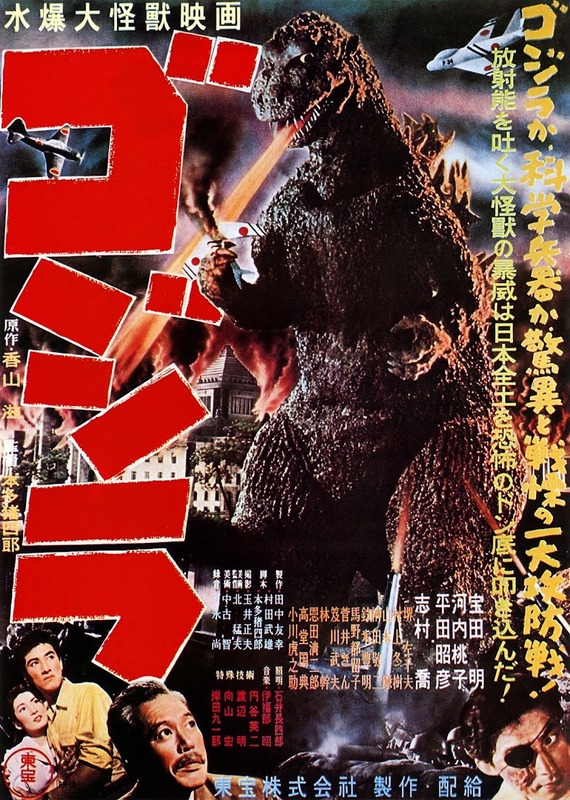 This hints at the low-budget nature of the film, but in fairness horror movies made to be distributed in Britain had to be shot so modestly to attempt any profit margin since their audience was restricted to the over-sixteens. Sweeney Todd: the Demon Barber of Fleet Street is a fun vehicle despite its budgetary limitations, due principally to the relish that Slaughter gives to the fabled man himself. The story is book-ended by a modern-day barber whose product sales tactics are deflected by a cynical customer. When questioned about the painting of Todd, the barber extols his virtues as the finest razor–wielder of them all and away we go back in time to the 1840s. 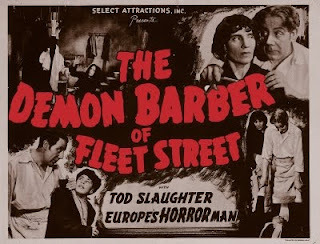 Slaughter is presented as the barber equivalent of an ambulance-chaser, hanging around the docks to ensnare grizzled customers fresh off the boat and in need of a revitalising shampoo and shave. “ Lovely lot of throats, the lot of them…I love my work”. Slaughter savours the ghoulish possibilities in the lines, often capped with a thick unpleasant snigger as he throws himself and his customers into his profession. Another Dickensian connection is the appearance of the insensitive and obtuse Beadle bestowing on Todd the eighth in a long line of young waifs straight from the workhouse, reminiscent of Oliver Twist. These poor urchins each vanish within a week to be replaced by another from the endless treadmill. Tobias (John Singer) is placed in the dubious care of Todd, who thanks the Beadle with sinister unctuousness and an evil chuckle of presentiment. What seems an initial kindly gesture of sending him out for one of Mrs Lovell’s pies is merely a well-practised ruse of removal while he services his latest victim. Mrs Lovell, played by Stella Rho, is a worthy and wily foil to Slaughter’s Todd. Her Italian accent gives her dialogue an edgy attack (according to IMDb the London-born Rho’s real name was Stella Giacinta Annabella Maria Nobili-Vitellesch). Theirs is an unholy and uneasy alliance, sitting on a powderkeg of mutual blackmail: “I could hang you Sweeney - like that!” Lovell finger-snaps at him. In various incarnations their relationship is that of lovers as well as grisly partners. Here, it is business, her acknowledged jealousy is not over his interest in the lovely Johanna, but in whether he might abscond with their combined profits. Intriguingly, this version of the tale makes only the subtlest allusion to the victims as pie-filler at the very end. Until then, likely a pre-emptive strike to avoid censorship, the Todd-Lovell partnership is that of basic murder followed by retrieval of the body’s goods and then an unspecified ‘dispatching’. We see Sweeney disposing of one such mark that he picks up at the docks, a suitably prosperous gentleman who winds up in the chair and is then tipped backwards into the cellar via a secret lever operated by the avaricious barber. A sub-plot concerns the young lovers Mark Ingerstreet and the aforementioned Johanna (Bruce Seton and Eve Lister). Sweeney is blackmailing her father (D.J. Williams) – who does he not? – for her possible hand in forced marriage over a failed shared ship venture in Africa in which Mark’s Captain is killed in a native uprising. The melodrama sub-plot has a grimly amusing moment when Johanna appeals to her dad desperately for another way out than a marriage of convenience: “Haven’t you anything you can realise money on?” He looks at her meaningfully: “No. Nothing”. Seton is a workmanlike actor, enlivened more when Mark’s suspicions about Sweeney prompt him to present himself in sideburns and wig disguised as a spirited Yorkshireman while his shipmate is in the cellar below ready to free him in the oddly conspicuous garb of a monk. Johanna is even less lucky with her get-up – her gamine pose as a boy looking for work is rumbled by Sweeney immediately. Mrs Lovell’s mistrust of Todd allows her to grow enough of a conscience to free Mark and in a climactic grapple with Sweeney, the barber is dropped by his own contraption into a fiery doom. As mentioned earlier, returning to a modern-day epilogue finally hints at the cannibalistic contents of the pie-lady’s wares, a vendor’s sign advertising ‘fresh meat’ as the customer skidaddles in fear. Though it goes for a safer veggie option, this meat-free Sweeney Todd earns its crust by Slaughter’s flavourful machinations and some artful concealing of miniscule resources in the period scene staging.